Banded is offering two hunters the chance to experience hunting at world class lodges with world class guides during the Super Hunt Giveaway 2017. Visit superhuntgiveaway.com now for your chance to win. 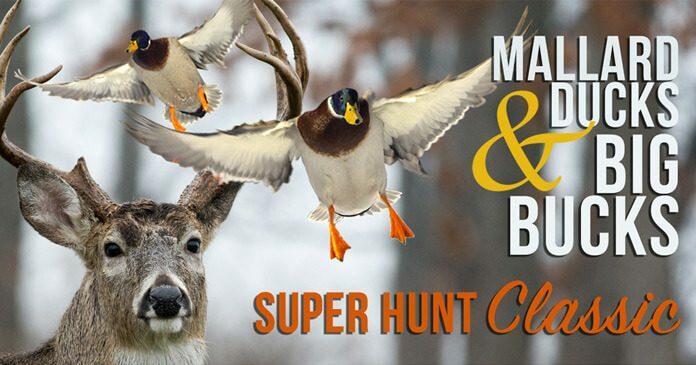 The Mallard Ducks and Big Bucks Super Hunt Classic Sweepstakes is open to legal residents of the United States (including DC) who have the age of majority in his or her state or territory of residence and as of the time of entry. One Entry per week person/mobile phone number/email address will be allowed. At the end of the Sweepstakes Period, a random drawing will take place on or about December 14, 2017, from all those that entered the sweepstakes. The winner will be contacted by the email address and/or telephone number that they provided on their entry form. One Grand prize winner will receive a hunting experience for themselves and a guest. The experience includes six (6) days on a hunt of a lifetime that will take place in early 2018 in Louisiana. Winner and guest will spend two (2) days with the Simmons’ Sporting Goods team, two (2) days at the Honey Brake Lodge and then two (2) days with Bill Jordan and Realtree Outdoors. The prize package also includes round trip airfare for winner and their guest to Alexandria, LA, $5,000 in Banded gear, and more. Total prize pool ARV is $15,000. To request confirmation of the name and address of the winners please send a self-addressed, stamped business size envelope to: The “Mallard Ducks and Big Bucks – Super Hunt Classic” Sweepstakes Winners List c/o ASC, 300 State Street, Suite 402, Rochester, NY 14614. Banded Holdings, Inc., 1710 Powell St., Springdale, AR 72764. Thank you for allowing me this once in a lifetime opportunity! !